Victor Lewis and Hugh Vasquez, principal cast members of The Color of Fear, a breakthrough documentary film on race relations in the United States, will draw upon their decades of experience in multicultural education and activism for an African American History Month presentation on Tuesday, Feb. 28, at 7 p.m. in Weyerhaeuser Hall’s Robinson Teaching Theatre at Whitworth University. The lecture is free and open to the public. For more information, please call (509) 777-4721. 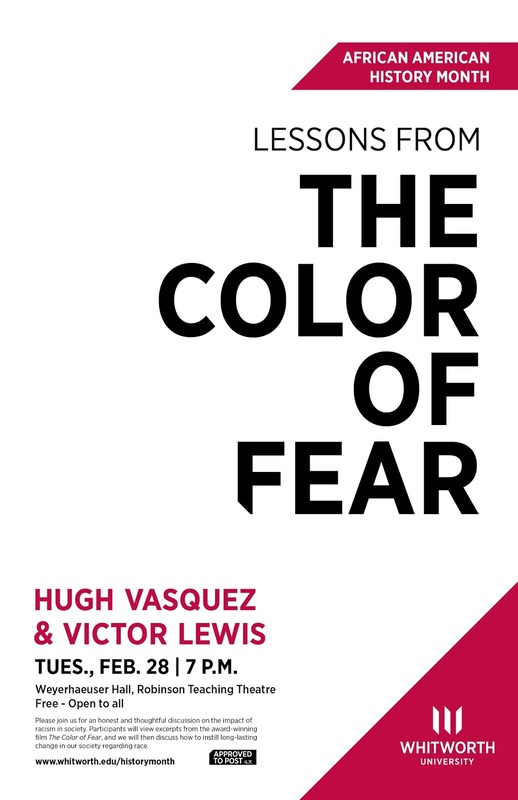 Lewis and Vasquez will engage the audience through dialogue and by posing questions about issues intersecting race, inclusion, privilege and gender. They will also show clips from the groundbreaking film The Color of Fear to support their points. Lewis and Vasquez also co-authored Lessons from “The Color of Fear,” a four-volume text used by educators, diversity trainers, and facilitators in conjunction with the film. Lewis is a nationally recognized social justice educator, trainer and activist who founded and directs the Radical Resilience Institute. Vasquez is one of the nation’s top diversity educators and national consultants to campuses and organizations. For more information on both speakers, please visit www.speakoutnow.org. David H. Garcia, assistant dean of student diversity, Whitworth University, (509) 777-4721 or sdei@whitworth.edu.